It must have been fate that this beloved national holiday just so happened to fall on the very day that I’m debuting my brand new cheesecake recipe. This cake is heaven-SENT I’m telling you. My family and I could NOT get enough of this silky cheesecake deliciousness. 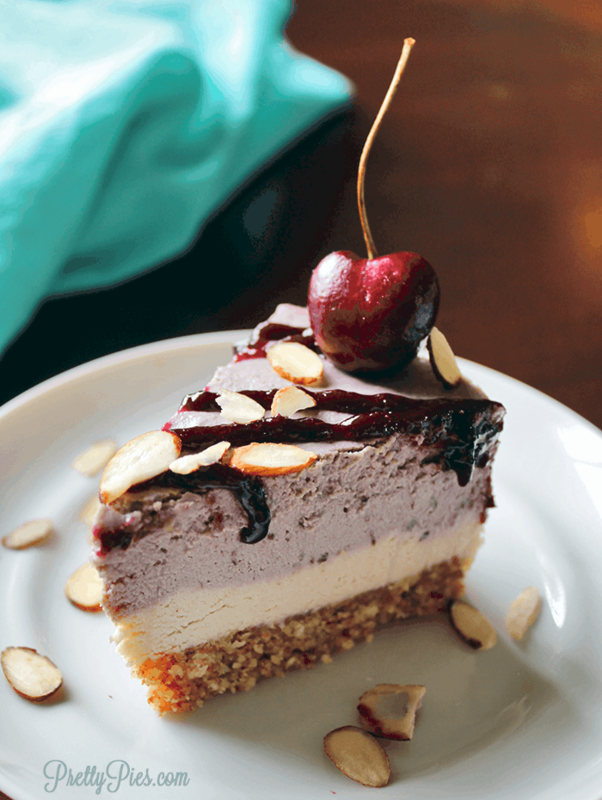 With a pop of sweet cherry flavor paired with notes of almond, vanilla on an almond coconut crumb crust. Oh em gee. 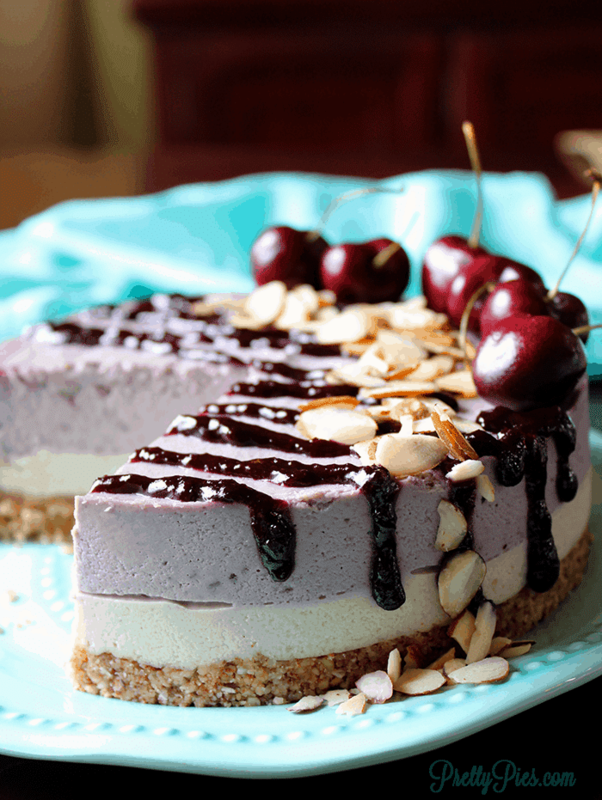 It’s no secret that vegan cheesecakes are my JAM. My absolute favorite thing on the PLANET to eat. How many have I made over the years?? I’ve lost count. 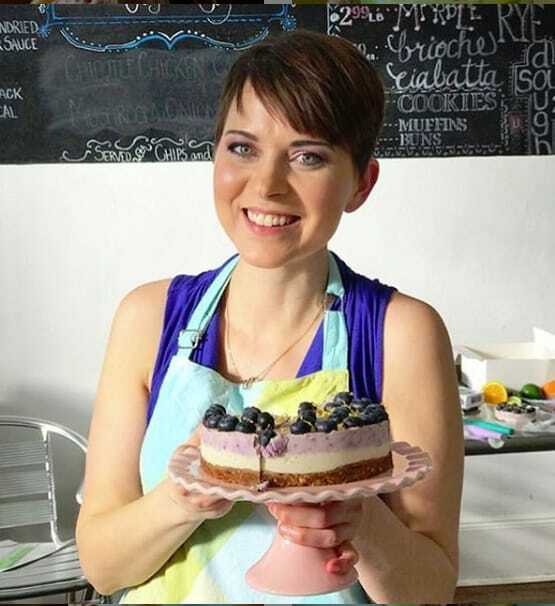 But you can check out my collection of cheesecake recipes here. And if you have never tried one, or maybe you have and you just didn’t like it, THIS is your chance to FALL IN LOVE with them. The secret to ULTRA SMOOTH cashew cream begins in the SOAKING. Don’t believe anyone’s claim that if you have a Vitamix you don’t have to soak your cashews. LIES. The cashews actually absorb some of the water. They plump up. They soften. You NEED to let this happen if you want it to be silky smooth. You can place your raw cashews in a big glass bowl and pour water over then and let them soak overnight. OR, what I’ve started doing is bringing a kettle of water to a boil and pouring the hot water over the cashews. Then they only need to soak for about 2-3 hours. It’s definitely a time-saver and a big help for people who don’t plan ahead 🙂 Like me sometimes. If you have seen one of those recipe videos on Facebook, like the on that Goodful made for my Blueberry Lime Cheesecake, you’ve seen how EASY these are to make. BUT, you have to realize they shortened the whole process into a one minute clip. What they are NOT showing is the actual length of time you need to blend your cashews. I put JUST the cashews in my food processor and blend them for a good 5 minutes, just to make sure they are realllly super smooth. You want a completely broken down ball of cashew bits. TIP: You need to stop and scrape down the sides, too. Get in there, folks! Your food processor needs a little help. This ensures no clumps. Would you believe this is my very FIRST cherry recipe?? 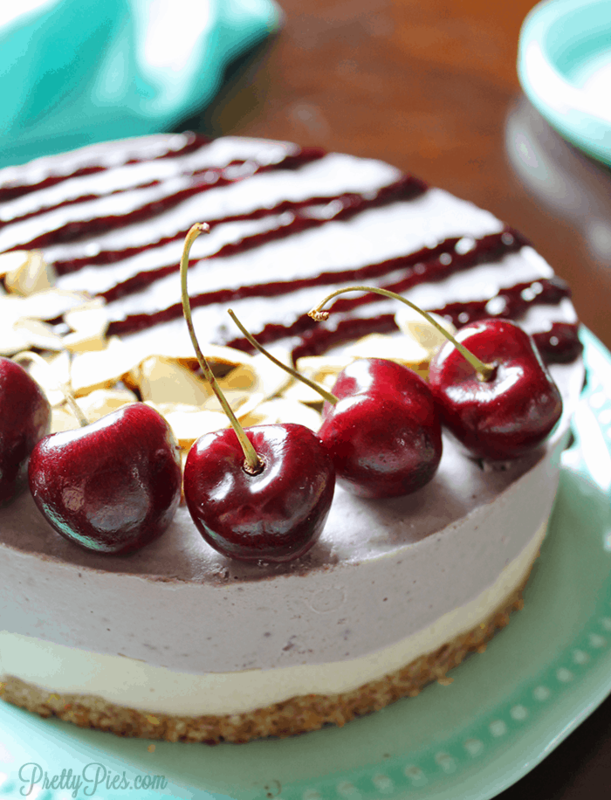 I owe it to my friend, Mr. Tom who made a request for cherry recipes. (Thanks, Tommy! And you’re welcome 😉 Plus Aldi had cherries on sale! Yay! Is it cherry season where you live?? Cherries are absolutely bursting off the shelves here in Texas. My kids could probably polish off an entire 2lb bag in one sitting if I let them, ha. We all love cherries at my house. The only thing I *don’t* love is the pits. Arghh,.. I’ve gotta find one of those fancy cherry pitters. 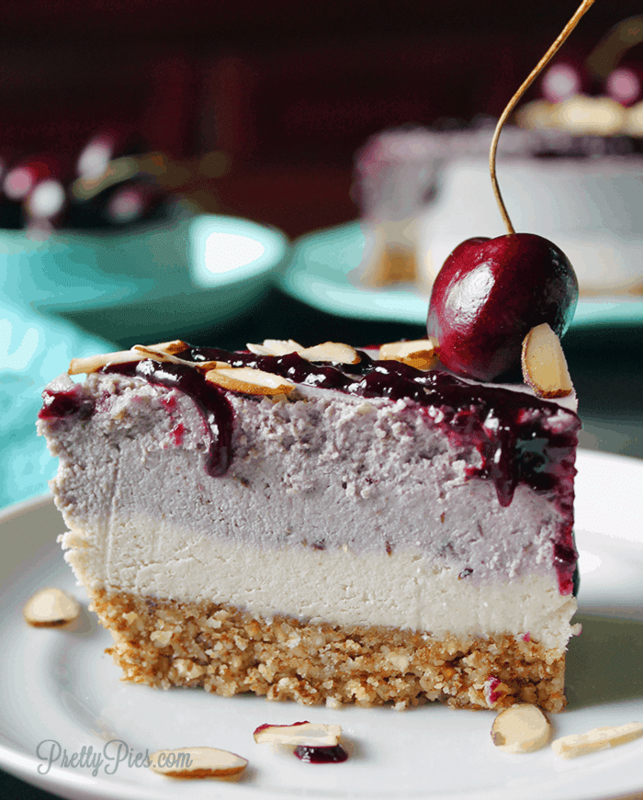 When you’re using 2 CUPS of cherries in a recipe, that would definitely come in handy. Or be prepared to have red hands for a while if you use a good old fashioned knife like I did. I don’t know if you noticed, but I’m using way less medjool dates in my crust recipes than I used to. The main reason is because I’m eating a much lower carb diet now, and dates are VERY high carb. But I’ve also become VERY fond of a less sweet crust. 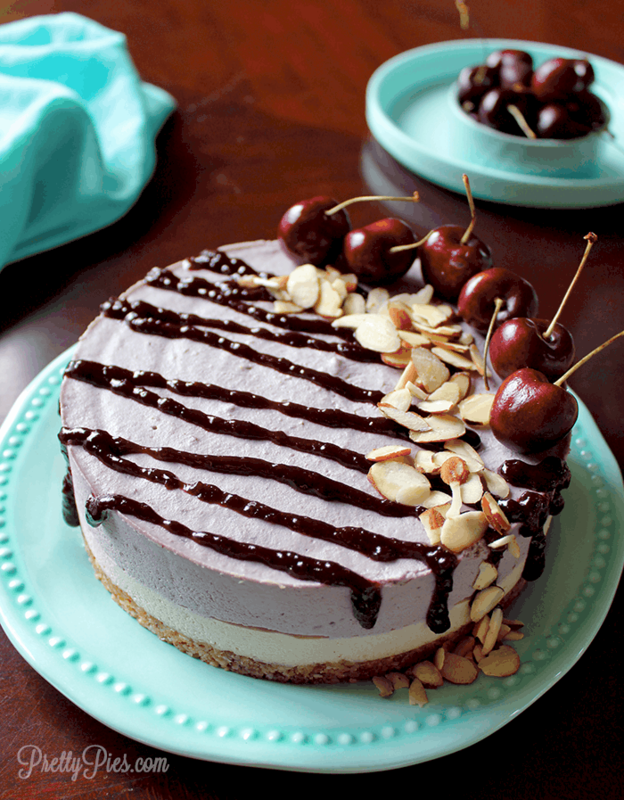 The way it contrasts with the sweet cheesecake filling is perfection in my book. I always add a pinch of salt so the flavor is really enhanced. This crust is almonds and unsweetened coconut + a little coconut oil and a splash of maple syrup and vanilla. I’m OBSESSED with the taste. It reminds me of shortbread cookies. It doesn’t distinctly taste like coconut or maple to me. Just a nutty cookie type of flavor. So yummy, I could eat the crust all by itself. And you totally could just scoop the crust into balls and make energy bites. YES. Extra… extract! I’m CRAZY about my extracts. I literally buy my vanilla by the QUART lol. It’s soooo good. I add it to everything. I buy this Mexican Vanilla and I’m not exaggerating when I say it’s the best vanilla I’ve ever tasted. I’m really diggin’ the drizz lately. It elevates not only the look of the cake (SO PRETTY) but it enhances the flavor, too! MORE concentrated cherry flavor, more drippy gooey silky texture, YUMMM. And don’t forget to top your drizz with some light crunchy almond SLIVERS. Ahhhh texture flavor crunch. Takes it over the TOP. Will you celebrate this special holiday with me?? 😀 Happy NATIONAL CHEESECAKE DAY, friends! Which flavor of cheesecake will you pick?? 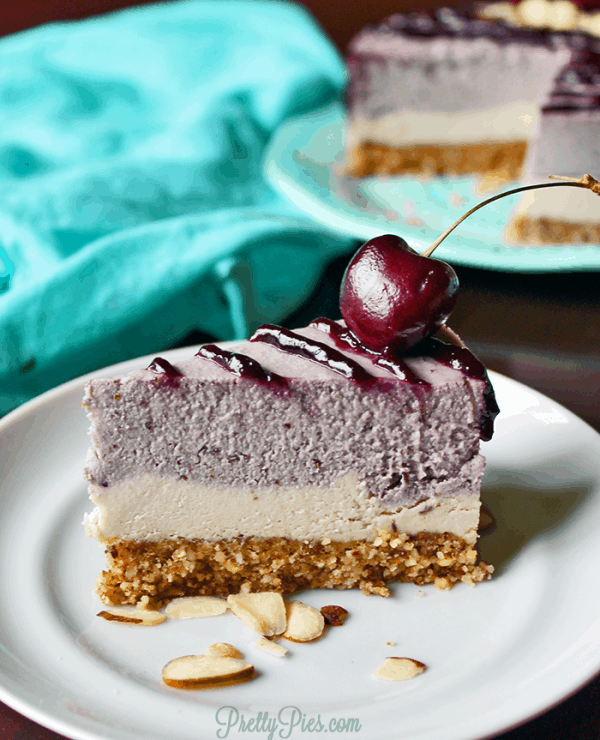 Silky smooth and full of sweet cherry almond flavor -- this cashew cheesecake will make you forget the dairy! 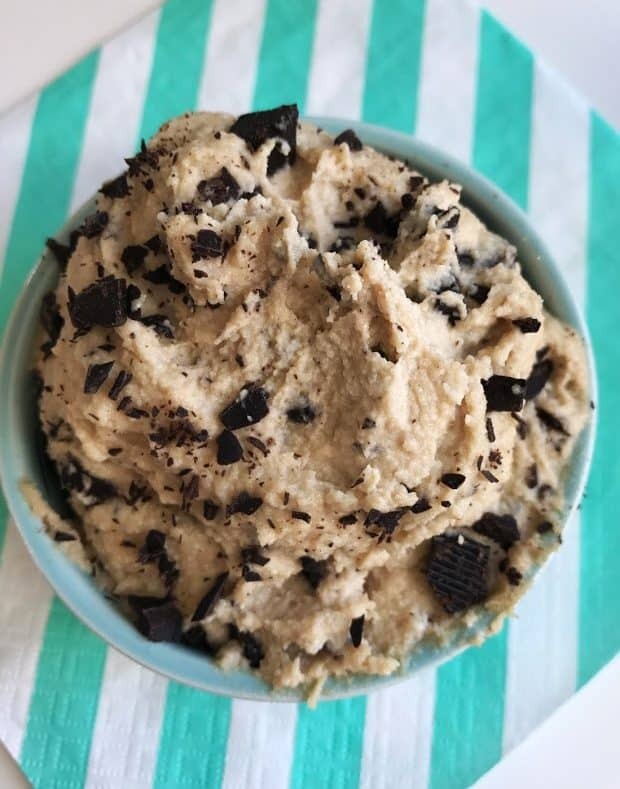 This no-bake dessert is a crowd-pleaser, vegan/paleo or not! Pulse together all ingredients in a food processor. Add a splash of water if it needs help coming together. Press into a parchment-lined 7" springform pan. Chill while you prepare the filling. (Use cashews that have been soaked overnight in a glass bowl/jar of water. OR soak in hot water - brought to a boil first - for 2 hours) Drain, rinse and shake cashews dry. Blend cashews in a food processor until completely broken down. Scrape down the sides and add the remaining ingredients *Except cherries*. Blend smooth. Spread about 1/3 of the filling on top of the crust, making a 1/2" - 3/4" tall layer of white cheesecake. Place in the freezer while you make the next layer. 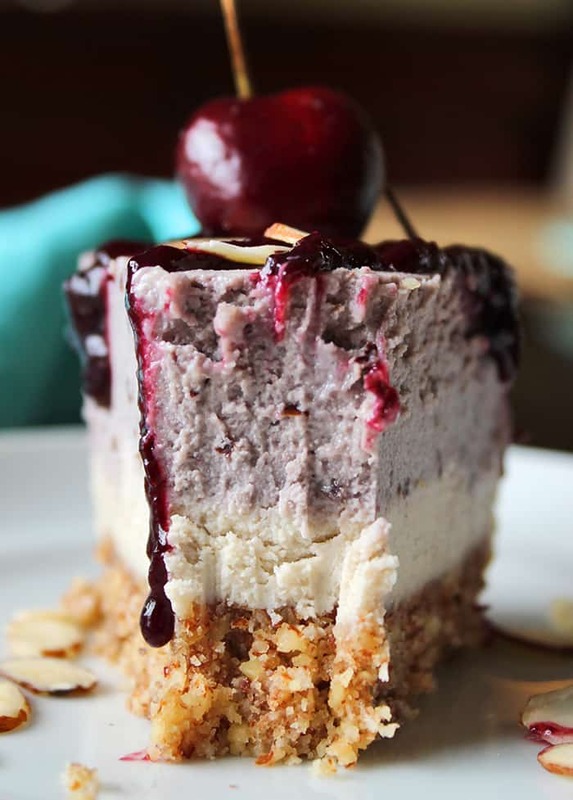 Pit your cherries and add them to the food processor with the remaining cheesecake and blend smooth. Taste and adjust with more almond extract or a splash of maple syrup, if needed. 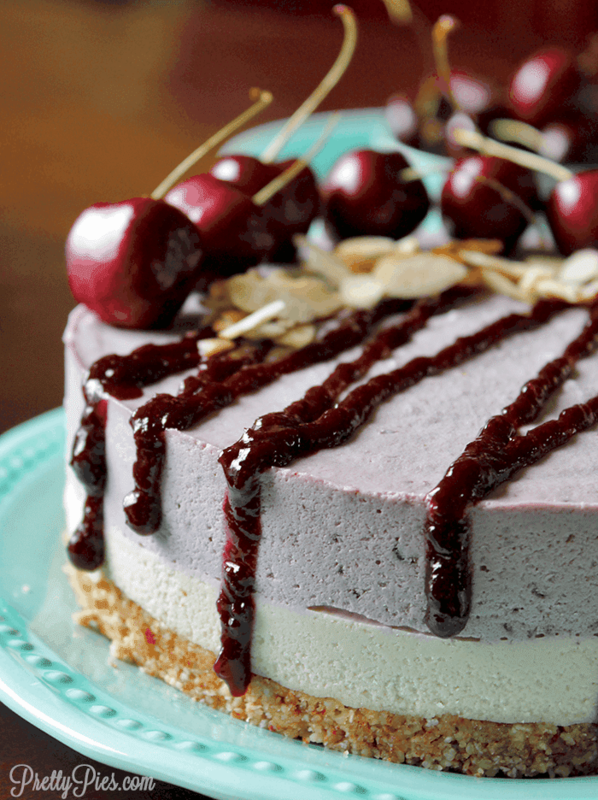 Spread the cherry layer on top and smooth with a spatula. Place a paper towel across the top of the pan, making sure it doesn't fall down in the center. Use tape if needed. Then wrap pan in foil. Freeze until solid, 3-4 hours or overnight. Once frozen, remove from springform and set at room temp until thawed to desired softness (30 minutes or so), or refrigerate until ready to serve. Add pitted/diced cherries, water and maple syrup to a small saucepan over medium heat. Bring the mixture to a low simmer for about 5-10 minutes and you stir and macerate the cherries with a spoon. Purée mixture with an immersion blender or food processor. Transfer to a baggie, snip off the tip and pipe on the drizzle after cheesecake has set. Disclosure: As an Amazon Associate I may earn a small commission from qualifying purchases made through referral links in this post (at no additional cost to you). Thank you for supporting Pretty Pies! Nordicware 7” Springform Pan https://amzn.to/2K2Lsep If you use a larger/standard size pan, your cake will be flat/short instead of tall and layered. I recommend light amber/golden maple syrup, which has a lighter flavor with no maple taste. To store: Keep refrigerated for about 1 week, or frozen for 1 month. Store without fresh cherries and almond topping. This entry was posted in Uncategorized and tagged almonds, cashews, cheesecake, fruit, holidays. These pictures are everything! 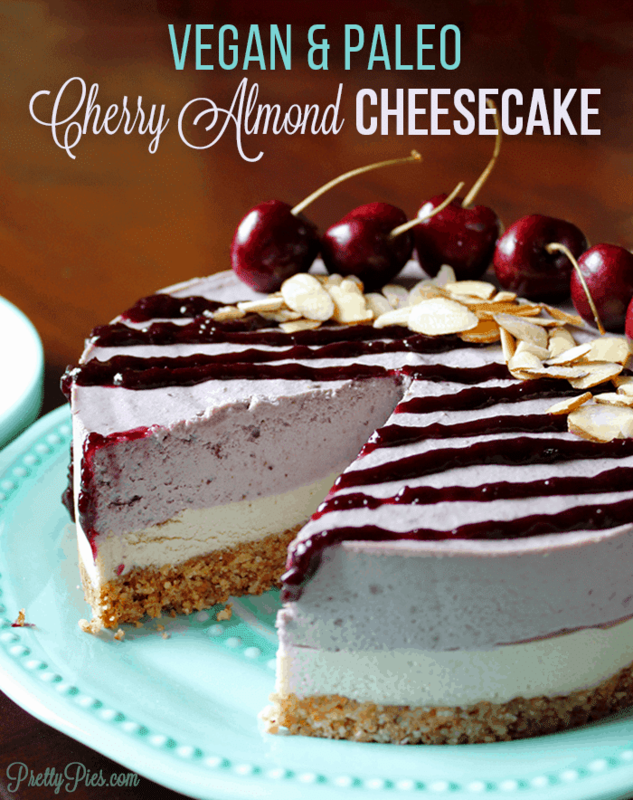 I have always loved the cherry almond combo! I can taste it already!